I remember the first time I read the classic book, Treasure Island as a child….it was my first adventure book and I can still remember my excitement as I read the classic pirates tale. I didn’t realize that there was a book sequel, Return To Treasure Island and was thrilled for the chance to share it with my own children, especially my five year old son who fancies himself a swashbuckler. Return To Treasure Island by John O’Melveny Woods picks up the story three years after Jim Hawkin’s “triumphant return from Treasure Island and he learns that Long John Silver has been captured and sentenced to hang.” My intent was to read a chapter each evening with my son before bedtime but quickly realized that some of the material was too frightening for him. I, on the other hand, devoured the entire story of Return To Treasure Island. I was instantly transported back to a time where my favorite characters from the literary classic came back to life in print and went on a search for the “greatest treasure of all, The Pharaoh’s Gold.” This action packed adventure novel was so well written that I was shocked to learn it is the author’s first novel. The action, mystery and even romance is such an exciting read that I found myself trying to figure out the secret codes myself. 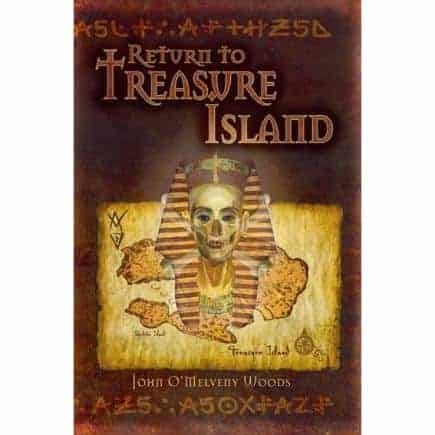 Return To Treasure Island would make a very special gift idea for a young boy or girl, teen or even an adult fan of action novels, adventures or the classic Treasure Island. This is one book that will remain in my collection until my son is a bit older and can enjoy Return To Treasure Island himself.